So, the other day I was out at my dad's farm. We were in the Quonset, which is a long circular steel building where farm machinery is stored. I was helping him choose a color to paint the bucket of his tractor. On the way out, cans of paint in hand, I spied an old, rusty chandelier hanging from a hook near the door. I mentioned it to my father and he jumped at the opportunity to bestow the old "treasure" upon his favorite daughter. He pulled over a ladder and quickly climbed up its precarious rungs. He handed the chandelier down to me. It was heavy and completely caked with layers of well-aged dust. Beneath all of the grime and rust, I knew this chandelier had the potential to be beautiful again. Now, I know not everyone is lucky enough to have an old chandelier thrust upon them, in fact, I had been looking for one for quite some time myself. I would suggest checking your local thrift stores, garage sales, online classifieds, or your grandparent's storage shed. Unscrew glass bulb covers and set them aside as you will not be needing them for this project. Be careful, the first cover that I removed shattered when I removed it. Old glass can become brittle. With scissors, carefully cut off the electrical cord from the top of the chandelier. In the image above you can see where the brown electrical cord is coming out of the top of the chandelier near the chain. 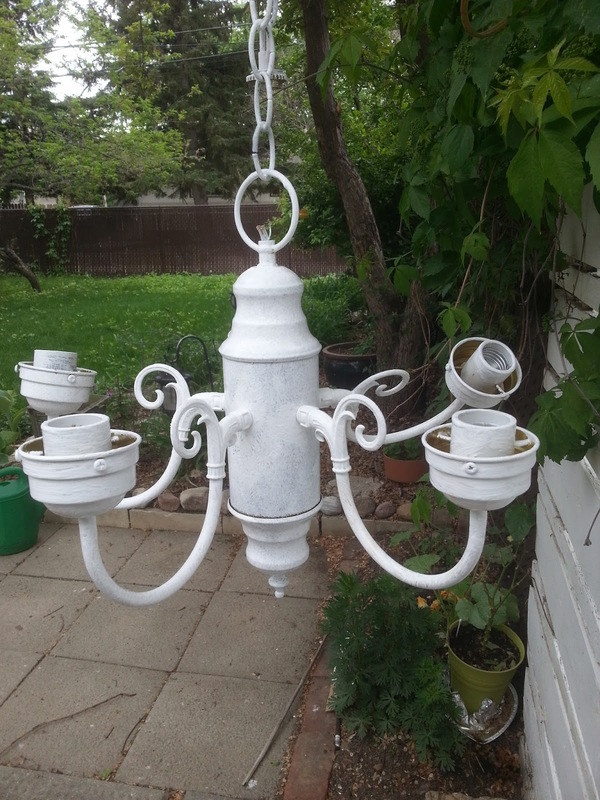 Hang chandelier from a plant hanger or shepherd's hook outside where you can easily reach it. With a wet paper towel, clean off all the dirt to expose the metal. Tighten any of the chandelier components that may have come loose during travel. I had to tighten the base. Dip your sand paper into a pot of water and gently sand the chandelier until it's shininess is removed. This is an important step, as paint adheres much better to a rough surface than it will to a shiny surface. Try to remove as much rust as possible with the sand paper. Re-moisten your sand paper if it becomes dry. 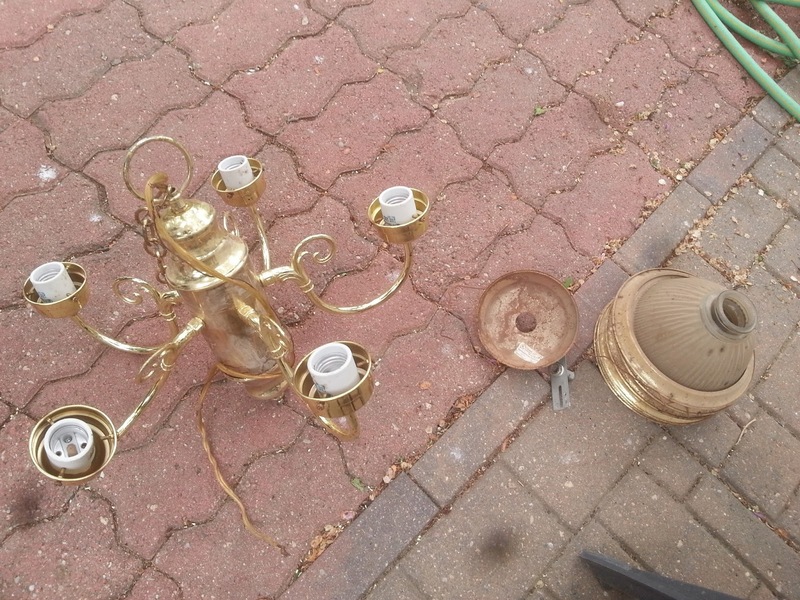 Use a wet paper towel again to clean off the chandelier to remove the debris created by sanding. Allow the chandelier to sit until it's completely dry. Apply one coat of primer. Let sit until dry. After priming, the chandelier will look splotchy, but don't worry, the paint will even everything out. When the primer is dry, I waited a full day, apply 2 coats of paint. I waited 5 hours in between coats. Make sure to dab your brush into all of the nooks and crannies. Painting the chain is the trickiest part! It began to rain about half an hour after my first coat, so make sure to check the forecast. Luckily, my apple tree sort of protected it. The next day, once all of the paint is dry to the touch, you can begin attaching the solar lights. This is the trickiest part of the whole project. Remove the solar lights from the round stakes they attach to. They will just pull off quite easily. Apply a thick bead of adhesive caulking around the base of the light. Place the light into one of the receptacles on the chandelier. Smooth the caulk gently with a wet finger to ensure good contact between the light and the receptacle. Once you have attached all lights, adjust any that appear crooked. Check back every hour or 2 to ensure that the lights are still sitting straight. The next day, I applied a second coat of caulking to ensure a strong bond. I would strongly recommend you do so as well. 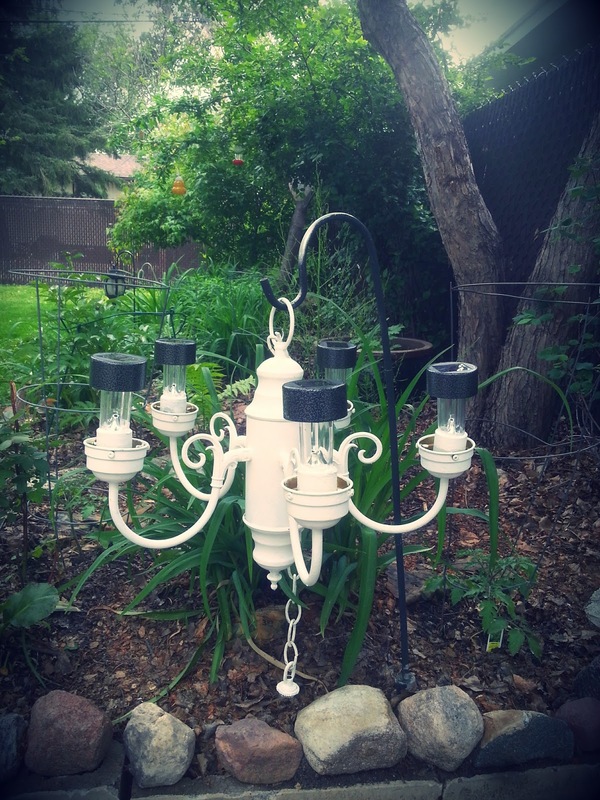 Once the caulking has dried, it's time to hang your chandelier! It's much easier if you have a friend to help. 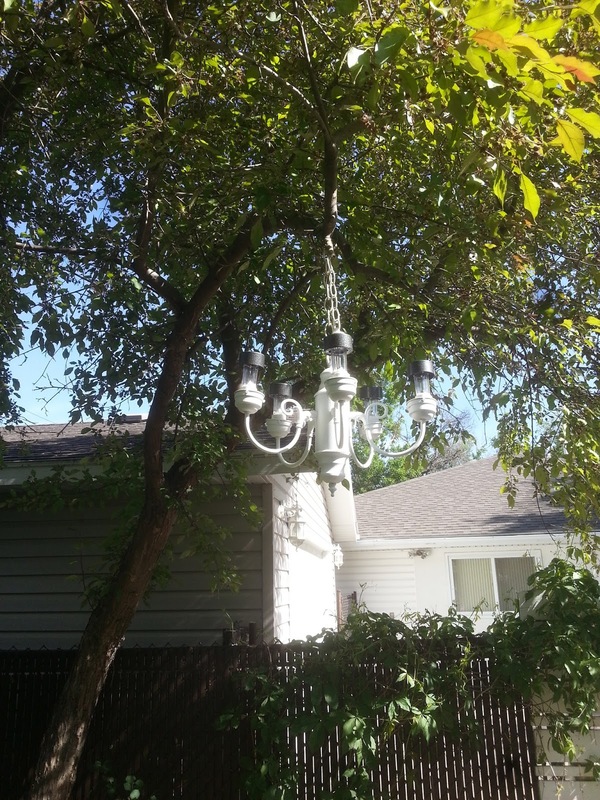 My husband held the chandelier while I stood on the ladder and affixed the chain to the tree with a strong wire. I used pliers to twist the wire which ensured a strong hold. Below is a picture of the chandelier hanging from a strong limb of my apple tree. I'm so happy with how it turned out and I have received many compliments from guests. It does a wonderful job of beautifully decorating and illuminating an otherwise dark corner of my yard. 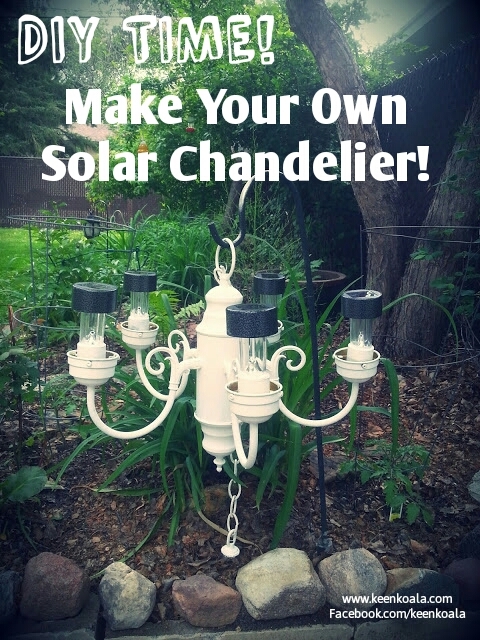 I hope you enjoyed this tutorial and it inspires you to make your own solar chandelier! Please share it with your friends.